4 pp. Roman, 628 pp. 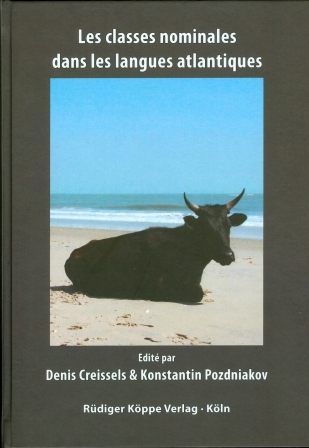 This book is the result of a five-year collaborative work within the framework of the ANR Sénélangues project under the direction of Stéphane Robert. The publication is about noun class systems in Atlantic languages, with a focus on Senegalese languages. There are about 60 Atlantic languages, whereby this book presents a quarter of them. The object of the work is to heighten the profile of non-documented or hardly documented Atlantic languages and to provide new research material of noun classes. Moreover, the publication describes noun class systems of Atlantic languages in Senegal synchronically. Following Pozdniakov and Segerer, Atlantic languages are divided into two branches: the North-Atlantic and the Central-Atlantic branch. Chapters 3 to 7 describe the languages Keerak (Joola from Kabrousse), Bayot Kugere, Joola, Manjaku and Balant Ganja that belong to the Central-Atlantic group. In the second half (chapter 8 to 16), the North-Atlantic languages Palor and Ndut, Laalaa (Léhar), Kobiana, Nyun Gunyamolo, Nyun from Djifangho, Biafada, Sereer, Basari and Wolof are presented. To simplify the comparison of data, the articles are arranged the same way. Every article begins with an introduction that includes some geographical and demographical information and comments on the current linguistic state of research of the respective language.